Be careful today and tonight, billions may die | Watts Up With That? Global warming may go on a last minute rampage. Maybe best to just stay at home and lock your doors, bar your windows, and turn your air conditioner on. If you live near the coast, head for high ground. Deaths due to drinking and driving will be nothing compared to this. This story appeared in The Canadian January 8th, 2007, it’s been a countdown example of stupidity ever since. Unbelievably, it is still on their website. Note today’s date. Assuming there is no last minute surprise attack by pesky methane clathrates, the Daily Bayonet wishes you a safe and happy 2012. If it happens, it will be the gaia fart heard round the world. Starting tomorrow they’ll just change the year. Don’t you love these predictions coming back to bite them in the a**e? Oh yes, and Happy New Year! May it be the Year of the Climate Realist! “Runaway Global Warming promises to literally burn-up agricultural areas into dust worldwide by 2012, causing global famine, anarchy, diseases, and war on a global scale as military powers including the U.S., Russia, and China, fight for control of the Earth’s remaining resources. Fanforkingtastic! Look on the bright side. Over 4.5 billion people will no longer have to worry about global warming, er climate change, er climate disruption, er climate Armageddon, er the weather. Yes. Journalism this excellent really helps voters make such well informed decisions in a democracy. Or as Chomsky called it, manufactured consent. Anyhow, this is going to be quite something. Unless i just screwed up my mental arithmetic it looks like it will take about 13 million AGW related deaths per day to hit that prediction by the end of next year. Not to mention the terrible toll on polar bears and lizards. John Stokes is [SNIP: Language. But I think everyone gets your point. REP]. 5 Years ago I said these hyperbolic abusers of science for political purposes were inflating a theory…for money…tax money. We have a conservative government now and all the lies are being undone. In January 2007 you lied. Why don’t you just shut your you lying mouth. The grown-ups are in charge now and you are just freaked-out left wing noise. I guess you have to go fart and wide to find sanity out there. Barrie Harrop is still bleating about the courts putting Lisa Jackson on hold. should recognize that predictions like this are preposterous. BUT…this was all supposed to happen BY 2012. So given that we are 30 seconds away from 2011 being over this is just another example of Mann Made Global Warming ™ prophesy that hasnt come to pass! Well you know what they say. We often get the claim their ‘figures’ were on the conservative side. They really wanted to say 6 billion could die. Anyway Happy New Year to One and All. Its the old and completely stupid permafrost scenario. Read this and chortle…a chortle is well deserved. Yes be careful. I clicked on their comments link which Firefpx blocked. 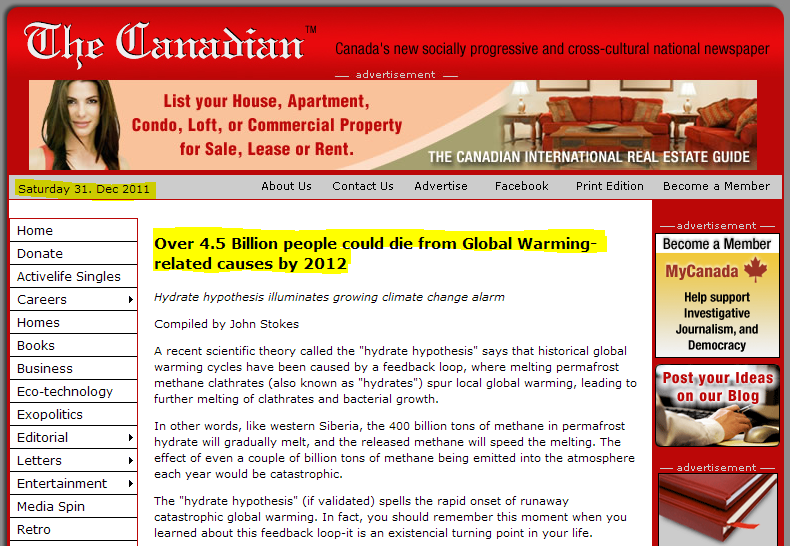 Then how come everyone didn’t die during the Holocene Climate Optimum? That’s when we were discovering agriculture and inventing beer. The Canadian describes itself as “socially progressive.” Need I really say more? Yawn. Twitter me when this actually happens. Listen out for that Great Gaia Fart. Should be good! Love the new WUWT Heading too. Best to stay home anyway. Primary danger is amateur drunks though. Nobody light a match – the thrust may move us into a new orbit, farther away from the sun. Sure would make it cooler. If you don’t read newspapers then you will probably be uninformed. If you do read newspapers, then you will probably be misinformed.. He who smelt it delta it. Hi Anthony, Mods and readers. Have a Happy New Year! I can’t access the tips and notes page for some reason, just wanted to point out that Prof. Nir J. Shaviv has a pole up on his site. Global warming causes everything … by this point in the season, we should have had nearly 37″ of snow but this year we’ve only had 3.8″ … it’s global warming, fer sure. And tomorrow, climate change kicks in and delivers 4″ to 8″ of global warming over the course of a day and a half. Anthony, didn’t you solicit comments of doom some time ago? You said you were going to do a report with them? Is it still on your schedule? So now do I do with all the cases of canned food in my bomb shelt… er basement? If methane clathrates present that much of a threat, the proper thing to do is harvest them as the energy resource they are. Thanks God…Al Baby is not in charge..so the world is OK. ! Happy New Year! Funny there are people (Socialist/ warmers) and the rest of us. Canada is well represented with both. Thank god for the rest of us! As America’s economy struggles, a funny thing happened on the way to the next-door neighbor nation that has up until now always been considered a dogleg off our economy. Canada’s economy is soaring. It’s that they did anything particularly unusual. And it’s definitely not that they are what economists casually dismiss as “a commodity economy” experiencing a temporary boom. In reality, Canada has genuinely gone its own way, getting itself out from the shadow of the US economic picture at just the right time. The government of conservative Prime Minister Stephen Harper has embraced free markets, not just one or two things, but a whole banquet of all the things that make economies grow – smaller government, free trade, one tax cut after another, and energy development and security. Net result? Same as what Chile got when it tried the same kinds of reforms – a booming economy. His Lordship may be having a word with them. Well its 2012 here and I haven’t noticed anything other than a need for an aspirin – maybe that’s it ? Farewell CAGW! Now for the Mayan apocalypse! Is it possible that we genetically programmed to groove on doom? Happy New Year to you and all. But that wasn’t true. Somethings are so unlikely that they really couldn’t happen, and this was one of the things that simply could not have happend. I second what Dave says. You all are celebrating too early, we have a year left for the whole planet to die. Bwahahaha! Or the Mayan thing could kick in just before then. I recommend drinking to excess tonight to kill the pain of thinking about our potential demise. Wait, that happens every year! It says ‘by 2012’. That’s ‘prior to’. No need to mangle the English language just because some of us are pished! Ahem. To what “20th century climate change” are we referring to here? Its a preloaded question, stating that 20th century climate change is a fact when theres no evidence of any such abnormal climate system behaviour. Its all in the language fellas. The word “Pollution” being one thats had its meaning perverted from meaning toxic or the contamination of air, water, or soil by substances that are harmful to living organisms to meaning a trace atmospheric gas by the warmistas and the media without people even noticing . Its one of those techniques that falls into the category of deception, such as showing ice breaking off a glacier, or a fat overstuffed polar bear on an ice cube or my personal favourite; steam from a chimney when they do a report on climate change or co2. Its already loaded. So once again in the field of human conflict, so much by so many depends on a daring few willing to stand up those who have devastated Europe and who now threaten to spread their misguided ideology to the rest of the free world. Airlines of America, China, India and the rest of the free world unite, brace yourselves and show us your finest hour. This is an example of predictive programing. The sheep who believe what they read in the “dailymedia” are being cultivated for events to come. They always telegraph their work. Look up predictive programing. I enjoy how our usual bands of trolls stay away in droves from this type of post. “The Canadian” seems to have died. The last articles are from 2009. The blog hasn’t been updated since then; it may have been replaced by a Facebook page. But the online newspaper itself seems to have had some stories added in 2011 (from the copyright dates); click on Home. Happy New Year! I can hardly wait for 12/12/2012 to laugh that one off as well. Canadian banks are very conservative and their charters don’t allow them to pull the stunts that the progressives like Barney Frank et al forced them to do in 1995 when they forced banks to loan money to people who could not afford to borrow it. I lived in the NorthEast and watched the whole thing blow up and cave in over 15 years. I can buy a house there for 1/2 I would have had to pay in 2005. Progressives…. they Cr@ap everything up….John Stokes included. My family seem to have escaped the Apocalypse (although I can’t find the cat this morning). Skeleton crews must be working at the power company and telephone monopoly, as services are normal, even as they struggle to bury their fallen comrades (about 3 dead for each survivor), and, miracles, a truck has just pulled up from the bakery with fresh bread! How do they do it, in the midst of such devastation and sorrow. My hat goes off to them. Ah, and there’s the cat — must have smelt the food. Yeah, in Canada, we have morons here too like Suzuki for example and Maurice Strong, just like Al Gore down there, or Harold Camping, or Jim Jones or Bill McKribben or ………………. Maybe 2012 will be the year when all those Hidden Variables finally pop out of the woodwork and devour us all! Not just the Hidden Warmth, but Dark Energy, Dark Matter, Higgs Field, the Hidden Sea Level Rise, Core Inflation, and countless others. All of them have been trapped for years by mere insubstantial Facts and silly old Observed Reality; all have been champing at the bit, just waiting to emerge from the minds and computers of Real Scientists where Real Reality lives. The online Fox News site has already posted an article about the Mayan fearmongering. An interview with leading Mexican archaeologists set the record straight. Per the experts, the prediction of future events was not a part of Mayan culture, but rather that of westerners who never seriously studied the culture. It will be an interesting 11 months, 12 days in the new year, as people wail once again that we are doomed. It makes me wonder if those at mag rag are the ones at the COP## are the one’s accepting the well deserved Fossil awards given to Canada, them Green Weenie Morons don’t deserve to take credit for them, what a bunch of publicity hogs they are! I predict within 150 years, by 2162 at least 95% of the people alive today will be dead. This is a conservative estimate. Governments should react decisively against the clear (and present?) danger. Perhaps additional taxation will help. Well, that’s at least consistent. Sell the house before property prices fall through the floor. If you survive, you can buy it back later. That headline looks like it is straight out of “The Onion” (if you haven’t read The Onion, google it & you will understand what I mean). 2012 the year of the “lifting of the veil” (the apocalypse), truth finally succeeds over the lies imposed by “consensus”. Yes, Jeff L, you know there is even a movie out about the Onion News. This may have proved as accurate as Moonbat’s (George Monbiot’s affectionate nickname) ‘prediction’ in 1987 that in 10 years half the species on Earth will be extinct, and in 20 years they’ll ALL be gone!! But what scares me is that every single science book or encyclopaedia I have seen here in the UK has this CC nonsense in it. Worse still, I have seen on the bookshelves of a museum bookshop, a slim, big print volume called ‘My First Science Book’ The CC stuff was very prominent. They start the indoctrination early now. “The Canadian” seems to be moribund, which is just as well, since there’s nothing Canadian about “The Canadian”. A more apt title would have been “The Torontonian”, or better still “The Queen Streeter”. A perversely awful blog. I’ve made my own doomsday predictions here in the past. For those who may have missed them I will repeat them here and now. I claim that unless we immediately embrace all the wonderful planet saving plans and regulations demanded by the UN, the IPCC, various leftist government figures, enviro NGOs and sundry others, 8-10 billion people will die by 2100. Of course, if we choose to completely ignore all that nonsense and proceed forward in our normal semi-rational manner the number of dead will be pretty much the same. If, in addition, we actually expanded market based economics far and wide across the planet, the number of deaths might even be substantially reduced. I base that assertion on the fact that, as people are moved to middle class incomes, two things almost always occur. First, their birthrates decline dramatically, leaving a smaller future population for the normal deathrate to work on and second, their life expectancies advance, meaning that globally the percentage of that smaller total population that the deathrate represents, will likely decline as well. You might not have noticed, but the oceans are gone, too. Since 1998, in fact. 37 minutes till 4.5 billion dead for me. it was not much of a er, um, big stink!! Happy New Year. Approved foolishness is the worst sort of foolishness. And, sadly, this is the approved brand of foolishness. And we’re not through with it yet. Since methane hydrate decomposition is an endothermic reaction (absorbing heat) it is self-quenching. This should have been a question that was asked and answered when it was first proposed. It’s a testament to the lack of scientific knowledge that the AGW fear-mongers bring to the discussion. Yawn… it’s 2012… Australia, you still there? UK? is worse than we thought! “Arctic Sea Ice Gone in Summer Within Five Years? An already relentless melting of the Arctic greatly accelerated this summer—a sign that some scientists worry could mean global warming has passed an ominous tipping point. The editor probably feels he was a Mayan in a previous existence. 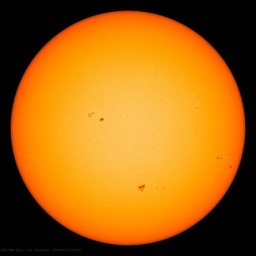 Thanks to global warming, we only have 6 billion, can you imagine the crowding. @gacooke: Why bring that general thermodynamic stuff into a climate discussion? Don’t you realize that climate science has its own set of natural laws? This methane clathrate thing has been around for years. Sometimes it’s from permafrost melt or seafloor melt. These folks are true environmentalists, they keep recycling the same old skeers. It’s now 2012. I’m still here. Be generous – give them until the end of 2012!!! World is full of BS… the trick in life is to wise up to it if you’re honest, and use it to your advantage if you’re dishonest. Too bad they look like they’re worth about 10, and made by children in a sweatshop. Oh dear. Still alive and still here…. Isn’t it illegal to shout “fire” in a crowded theatre when there is clearly no fire? “Progressives” love Humanity. It’s humans they don’t like. I see brain dead people…. and they don’t even know they’re brain dead! They just ‘believe in Man Made Global Warming’. 4.5 Billion…. Yeah. That’s about right…. Did you not know: “Now that most scientists agree human activity is causing the Earth to warm”??? The killer odorless fumes of doom crept as we crapped are way to the crypt. 4.5 billion times 150 lbs of rotting flesh. A fly paradise. All that’s missing is the selection of prurient photo galleries. I don’t think anyone should be taking that site as a representation of anything mainstream, any more than stormfront represents conservative thought. 4.5 billion? Seriously? Nobody with a brain is going to buy that, and it was only originally published 5 years ago. It’s not the fart that kills you it is the smell.